Actor Barry Morse, best known for his role as Lt Philip Gerard in the classic drama The Fugitive but who also starred as knowledgeable Victor Bergman in the first season of Gerry Anderson’s live action series Space:1999, died earlier this week after a short illness. He was 89. His much-praised career spanned more than seven decades, and his official web site estimates the actor played more than 3,000 roles on radio, television, stage and in film. He was a five-time winner of Canada's Best Television Actor award and the former Artistic Director of the famed Shaw Festival of Canada. "Up against Martin Landau and Barbara Bain’s comically straight-laced turns, Morse provided some much-needed sparkle," writes Mark Wright in a tribute to the actor in The Stage. "When asked to rattle off some piece of technobabble, there’d be a mischievous smile pulling at the corners of his mouth before he delivered undeliverable lines with gusto. 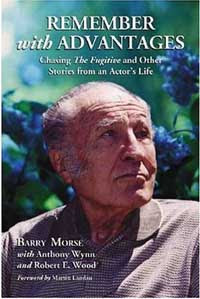 More actors in science-fiction shows could learn from his fine example – take it seriously, but not too seriously…"
Barry's autobiography, Remember with Advantages, was published in 2006, in which Barry candidly related his childhood as a Cockney boy in the East End of London and his win, against all odds, of a full scholarship to the famed Royal Academy of Dramatic Art at the age of 15. He describes how this unlikely beginning propelled him into an international career on stage and screen, including starring roles on Broadway, London's West End, and in television series such as The Fugitive, Space:1999, and The Winds of War. He crossed paths with numerous notable figures along the way, including George Bernard Shaw, Noel Coward, Peter Cushing, Alfred Hitchcock, David Janssen, Robert Mitchum, and many others. Speaking to the BBC, Barry's son, Hayward Morse, said his father's proudest achievement was reviving the George Bernard Shaw theatre festival in Ontario, which he rescued from financial crisis after becoming its Artistic Director in 1966.